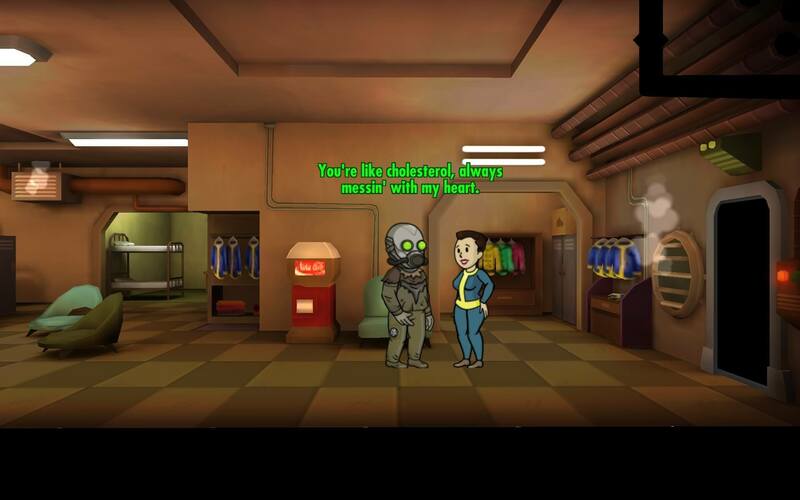 Put simply, Fallout Shelter is a stripped down base building game that takes cues from This War of Mine and XCOM: Enemy Unknown. It’s simple to a fault. Choose where and which rooms to construct to maintain your resources, assign your Dwellers to the room that best suits their skills and occasionally send the strongest/luckiest out on their own to scrounge for supplies. 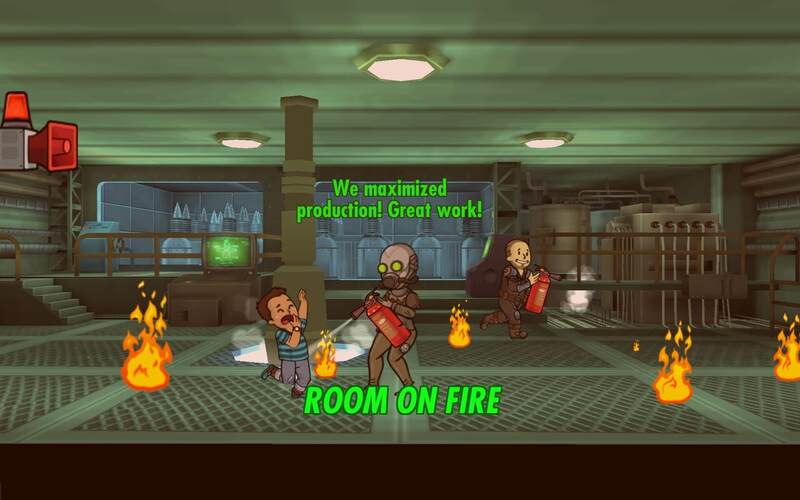 Sorry, damn fire in my power plant. BRB. I doubt Shelter will hold my interest for more than a few days because there really isn’t a lot of content here and there’s no endgame, you just go on forever. I’ve got quite a few more rooms yet to unlock but I don’t think I’ll be engaged enough get to the last one. So I want to talk about the time I will spend with it, because so far it’s been enjoyable. I hesitate to call it fun, there’s not enough depth in the mechanics for that, but I spent most of yesterday on planes and trains and Shelter was a welcome and pleasant distraction. There’s brevity here, something welcome in a post apocalyptic underground bunker. The art style is whimsical, the writing makes you smile and there’s almost a relaxing feeling that washes over you as you play. On the face of it, this could be just another mobile game that lives up to the unfortunate stereotype. It’s free to play with micro transactions, you have timers and you tap for resources. But look a little deeper. Literally. Zoom in. You breed your denizens like rabbits. Watch them flirt with each other. Just try not to chuckle at that. The game isn’t especially wordy, but the writing really brings a soul to the game if you pay attention to it. If Fallout 4 has this same tone then I definitely want to play. I would definitely like to see some development. I’d love a better system for defending your base against raiders. I’d love a family tree system so I know who is related to who. 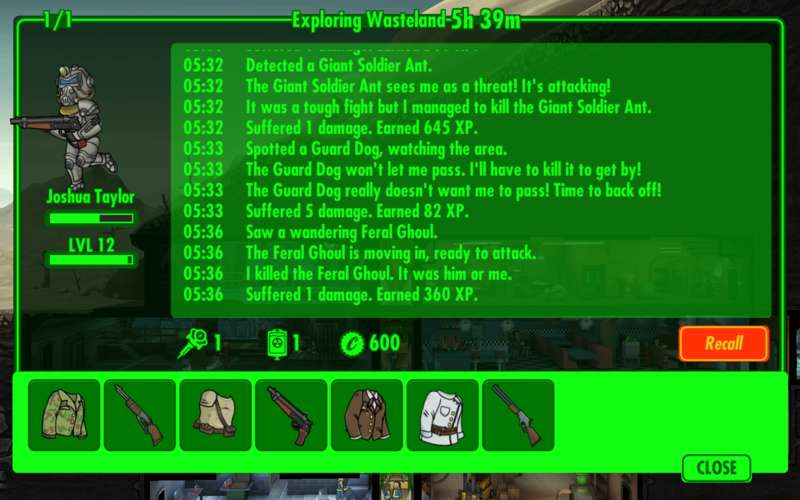 I’d love to be able to actually raid locations with my dwellers. As a standalone game, it feels like a first step awaiting an expansion. This is little more than an advergame to spawn interest in the run-up to Fallout 4‘s release, but it’s been created with a love of the world it inhabits. It’s a pleasant time killer that surprises the mobile game in you. You can Rush rooms to harvest resources faster, but you also gain currency here instead of having to spend it. There is a real money store, but I actually had to go looking for the damn thing and I haven’t felt any need whatsoever to use it. If Fallout 4 will make me grin like Shelter does, then yes, yes I do.